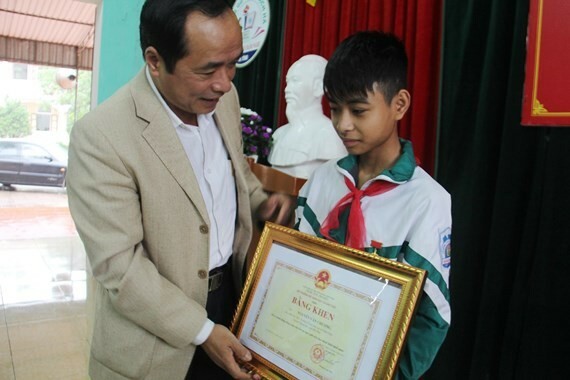 On behalf of the Minister of Education and Training, Director of the provincial Department of Education and Training Tran Trung Dung yesterday gave Certificate of Merit to seventh grader Nguyen Van Chuong who rescued the two drowning kids in a canal last month. On the day, on behalf of the Central Committee of Ho Chi Minh Communist Youth Union, the provincial committee of the union also awarded Medal of Bravery to Chuong for the brave deed. Before, on February 16, first grader Le Tran Quang Truong and second grader Nguyen Tien Thanh tramped. Truong stepped to Ke Go canal to wash hand but he slipped and fell into the canal. Thanh attempted to drag his friend out of the canal but he also fell into the canal. Both were swept away in the violent water flow. 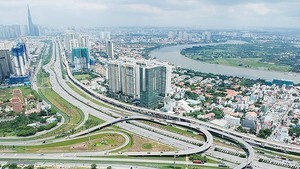 Chuong and his friend Nguyen were riding the bikes near the canal in the nick of the time. They quickly ran along the canal to catch the two drowning boys and Chuong jumped into the canal to pull the drowning boys out of the water.